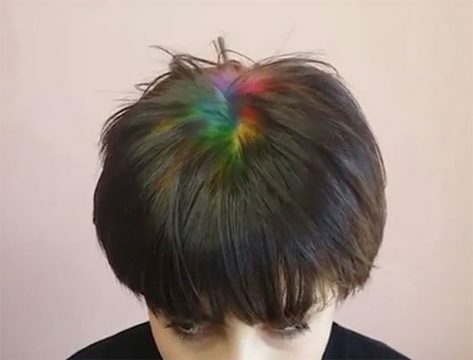 While rainbow hair is something best left to reality TV stars and tweens, rainbow roots – which are only visible when you ruffle your fingers through your hair or wear an updo—are pretty fantastic. I watched a video in which a dark-haired woman got this style after bleaching her roots to smithereens. Since my roots are already sans pigment, perhaps I was already primed for this cheery ROYGBIV look. I reached out to celebrity stylist Jet Rhys, of the California-based Jet Rhys Salon, for some enlightenment. These days, gray is starting to creep through my hair. I know, I know: It’s a natural part of aging. But I just can’t embrace it, so please don’t waste your time lecturing me — I’m not ready to go all-the-way, Eileen-Fisher-model gray. But I am bored silly with the usual process of covering up my roots. So instead of cursing them, I wondered if I should light up my life and turn my roots into a source of fun and joy. The possible answer: rainbow roots.